Anyway, now that Bagpuss has woken up, all his friends are waking up too, and you know what that means… yup, gig time! 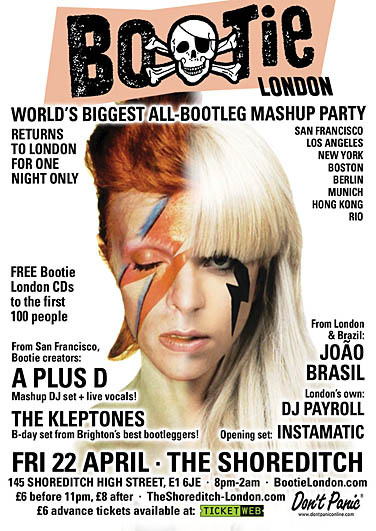 Having shook off a few cobwebs last Saturday with a brief set at the People’s Republic Of Disco in Brixton (and thanks to the esteemed PROD comrades for having me, and all their supporters who made me feel very welcome), We’re delighted to announce our participation in the return of Bootie London! 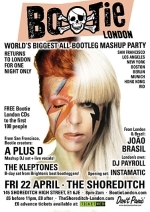 This time in Shoreditch, with A+D hooked in en route to a festival in Holland, the legend that is Joao Brasil, Host DJ Payroll and our great comrade-in-arms, and man of many pseudonyms Instamatic providing the opening set, it’s going to be another cracker. To make it even more storming for me, it’s on Friday 22nd April, which is also my Birthday, which means public displays of drunkenness and proclamations of best-frenderies may well abound. Not sure what form the set is going to take yet, as I don’t have specs for the venue, so there might not be room for the full AV experience, but sure as eggs is eggs, you know it’s going to be good. There’s advance tickets available this time too, which should please all of you that kvetched about the queue at Cargo last year. You’d better buy up soon too, because I’ve got a feeling it’s going to sell out in advance, and I don’t want any boo-hoo if you turn up and can’t get in, okay? You’ve been warned! So once that’s got the juices flowing, we’re straight into festival season already, and back in the Netherlands on Saturday 7th May to appear at the Mama’s Pride festival, at the Burgemeester Damenpark in Geleen – It’s a two-dayer, and completely free! The Selecter are headlining the Sunday, and we’re headlining the Saturday so really, my little Netherlanders, you really should get yourselves down there!